Posh sponsors Mick George Ltd are giving away four pairs of VIP match tickets for the League One match at Coventry City on April 8 as prizes in an easy-to-enter competition. And to go with the tickets they are providing free travel to the game in a Party-Bus which features a disco floor, jukebox, karaoke machine supplemented by bubbly on ice. In addition the lucky winners will get the chance to meet the players in the changing room prior to kick-off and receive a hospitality package that contains a three-course meal and refreshments. For the chance to win this amazing experience, all you have to do is register at www.mickgeorge.co.uk/vipposh before March 30. The day begins with collection from the ABAX Stadium at 10am before heading to the Ricoh Arena in time for lunch. It is anticipated that guests will arrive back at the ABAX Stadium for approximately 7pm. 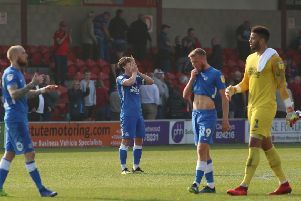 Neil Johnson, technical director of Mick George Ltd, commented: “Throughout the season we have engaged with the Peterborough United fans in various ways to try and improve the match-day experience whereever possible. “The fantastic support of the club’s fans hasn’t wavered and we are keen to reward their loyalty by giving something back. The limousine travel last year was particularly well received, so we thought we would mix it up a bit this time around.